A site dedicated to Pixar Animation Studios, one day at a time. As is probably no surprise, not only am I a Pixar fan but also a Disney fan, especially of their theme parks. So when the worlds of Pixar and Disney collide, I get very excited! I attended Pixar Weekend held a few years ago at Epcot, but sadly, this is one I probably won't be able to participate in. The Walt Disney World Resort is holding their Disney Pin Celebration 2016 Pixar Party at Epcot on Friday, August 26th and Saturday, August 27th (why the party isn't about 3 weeks earlier when I'm in Disney World, I don't know!). 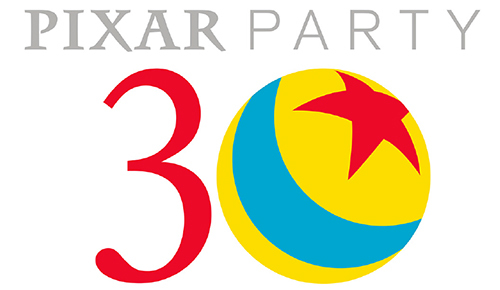 This party will celebrate Pixar's 30th anniversary and will have pins honoring their feature films, short films and characters. I was just checking out the merchandise catalog and wow, it's full of lots of unique and awesome pins and sets. The celebration is a hard-ticket event – besides admission to Epcot, admission to the party will cost $140/person. This covers admission both days, trading board games (4 vouchers/day), auctions for pre-production and artist proof pins, artist signings, the ability to pre-purchase select party merchandise and some limited edition commemorative gifts including a welcome pin and goodbye pin set. Plus, every guest will receive a $30 Disney gift card, so that may make the cost not seem so steep. Besides the 2 day party, you can also sign up for the Little Chef Pin Breakfast, which will be held before the party starts Friday morning. The price for breakfast is $45/person and will include Pixar-themed food such as Flick's Fresh Fruit Picks, Radiator Springs Hubcaps and Oil, Remy's Whisked Eggs, Ratatouille Style Vegetables and Mike (Cinnamon) Roll-zowski! In addition to the food, breakfast goers will also get early access to the party and a limited edition commemorative gift pin. If you're a Pixar fan and pin collector, this looks to be a once-in-a-lifetime sort of event! Tickets went on sale in late April, so if you're interested, head over to the official Disney Pin Celebration website to buy tickets and get more information. Pimp My Code, Book 2: Grand Central Dispatch's Achilles Heel. Final Year Film Blog - "Babbit"
"ele story" is going to ENK in New York! SO I actually did finish in time.